In 1930, German engineer Wunibald Kamm founded the FKFS (Forschungsinstitut für Kraftfahrwesen und Fahrzeugmotoren Stuttgart or Research Institute of Automotive Engineering and Vehicle Engines Stuttgart). The FKFS was an organization that tried and tested new, inventive ideas in the field of automotive technology. However, it was not long before Kamm’s thoughts and some of the FKFS’s resources were directed toward aircraft engines. In mid-1938, Kamm was able to persuade Willy Krautter of Hirth Motoren to join the FKFS as head of the FKFS’s Special Engine Group. Krautter’s first project at FKFS was building FKFS’s first aircraft engine. The result was a flat, air-cooled, two-stroke, four-cylinder engine that displaced 31 cu in (.51 L) and produced 25 hp (18 kW). The engine was used in the Hirth Hi-20 MoSe motor glider. Next, Krautter designed an improved and updated version of the four-cylinder engine, but priorities had shifted with the outbreak of World War II. Inspired by an open request from the RLM (Reichsluftfahrtministerium or German Ministry of Aviation), the FKFS focused on designing much larger engines. The RLM was interested in large, powerful engines for bombers being designed to reach targets in North America. Both Kamm and Krautter believed that air-cooled engines were overall superior for aircraft use, and they designed a 32-cylinder engine intended for the RLM. This radial engine had eight cylinder banks evenly spaced at 45 degree intervals around the crankcase. Each cylinder bank consisted of four inline, air-cooled cylinders and a single overhead camshaft. The cylinder proposed for the engine was designed by Krautter and was undergoing tests at the FKFS. Building a new aircraft engine from scratch is a massive undertaking, so Krautter suggested grouping together existing, proven engines to quickly create a larger, more powerful unit. 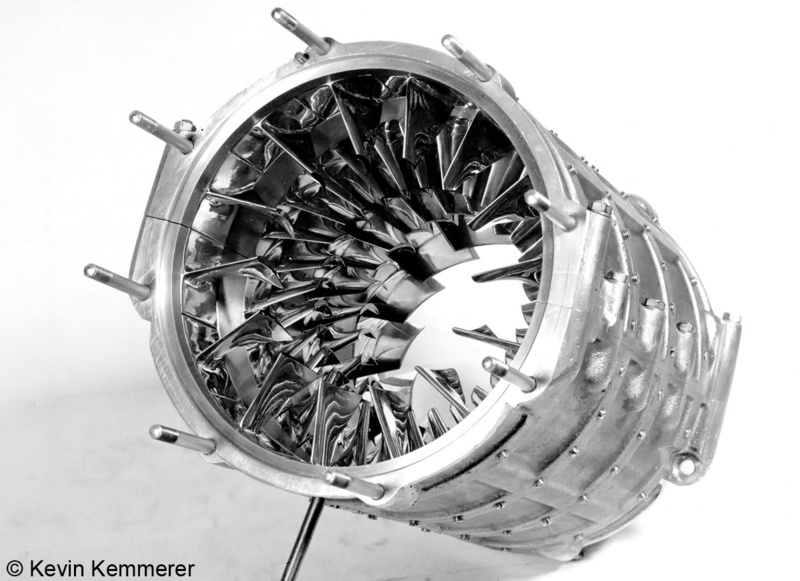 Kamm supported Krautter’s idea of a Gruppen-Flugmotor (Group Aircraft Engine), and the detailed design of such a power unit commenced in 1939. The first engine was known as the Gruppen-Flugmotor A (or just Motor A), and it utilized almost all of the components from four Hirth HM 512 engines (excluding their crankcases) to create a new 48-cylinder engine. Undoubtedly, Krautter’s experience at Hirth Motoren influenced his decision to use HM 512 parts. The Hirth HM 512 was an inverted, air-cooled, V-12 engine. Its individual cylinders were arranged in two rows spaced at 60 degrees and attached under an elektron (magnesium alloy) crankcase. Four long studs held each cylinder to the crankcase, and the cylinders were staggered to allow the use of side-by-side connecting rods. Each cylinder was made of cast iron and had an aluminum cylinder head. In the Vee of the engine, one intake and one exhaust valve per cylinder were actuated by individual pushrods driven by a single camshaft. Each cylinder had two spark plugs—one on each side of the cylinder. The intake and exhaust manifolds were mounted to the outer sides of the cylinder banks. The HM 512 had a 4.13 in (105 mm) bore, a 4.53 in (115 mm) stroke, and a displacement of 729 cu in (11.9 L). The engine produced 450 hp (336 kW) at 3,100 rpm. For the Gruppen-Flugmotor A, an HM 512 crankshaft occupied each corner of the engine’s large, square-shaped, aluminum crankcase, and a camshaft was located at the apex of each corner. 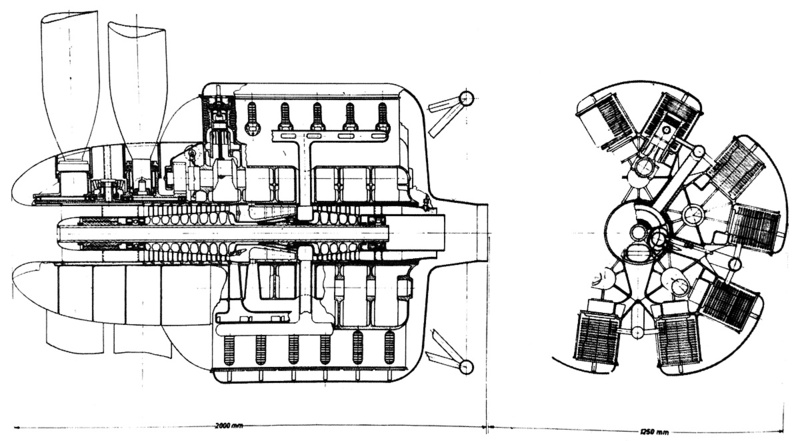 The cylinder banks for each engine section were on adjacent sides of the Gruppen-Flugmotor A’s crankcase. The two-piece aluminum crankcase was split horizontally and incorporated cooling fins on its exterior. At the front of the Gruppen-Flugmotor A’s crankcase was a central combining gear that took power from each of the four crankshafts and transmitted it to a single propeller shaft. The crankshaft of each engine section could be decoupled from the combining gear if the engine section were damaged or to conserve fuel and increase an aircraft’s range. It was believed that the Gruppen-Flugmotor A’s economy could be increased up to 56% by decoupling two of the engine sections while cruising during a long-range flight. Another unusual feature of the Gruppen-Flugmotor A was its use of two axial superchargers that provided 11.6 psi (0.8 bar) of boost. The left and right sides of the engine each had one supercharger located between the cylinder banks. The axial superchargers had four stages (although photos appear to show three compressor stages and four stator rows) and were driven from the accessory section at the rear of the engine. Fuel was injected ahead of the superchargers and subsequently mixed with air. The air/fuel mixture was then fed to the cylinders via long induction manifolds. The engine’s four Bosch dual magnetos and other accessories were mounted to the rear of the engine. 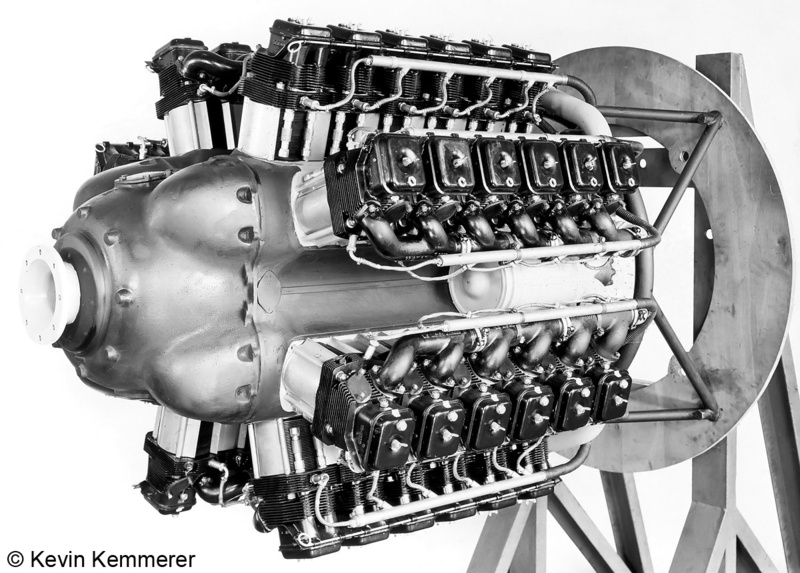 The Gruppen-Flugmotor A had 48 cylinders with a 4.13 in (105 mm) bore and a 4.53 in (115 mm) stroke. The engine’s total displacement was 2,917 cu in (47.8 L). Unfortunately, most of the engine’s specifications have been lost, but it was around 6.07 ft (1.85 m) long and 4.27 ft (1.30 m) in diameter. The engine produced 1,970 hp (1,470 kW) at 3,200 rpm with manifold fuel injection. A switch to direct fuel injection was made by changing to Hirth HM 512 D cylinders that had an unused port in the cylinder head. With direct fuel injection, the Gruppen-Flugmotor A’s output was increased by 200 hp (150 kW) to 2,170 hp (1,620 kW). The engine was tested during 1941 and 1942, but test information has not been found. Photos indicate some trouble was encountered with the axial superchargers failing in dramatic ways. 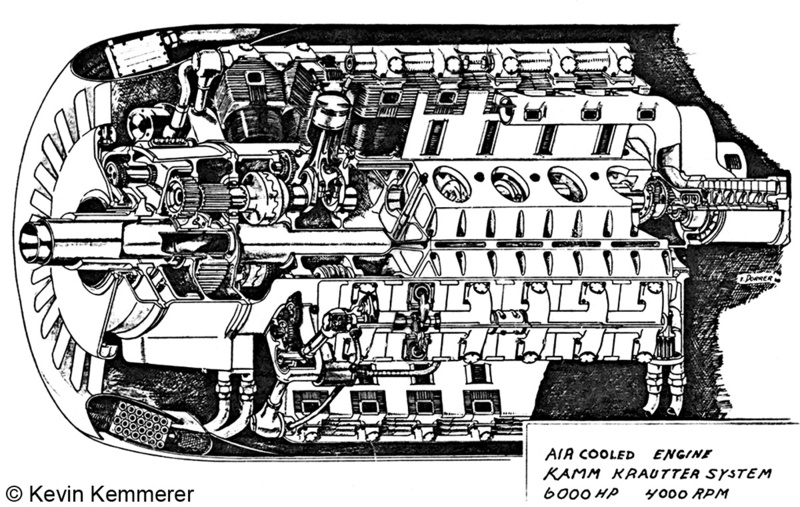 After the war, Krautter stated that the engine was capable of 2,400 hp (1,790 kW). 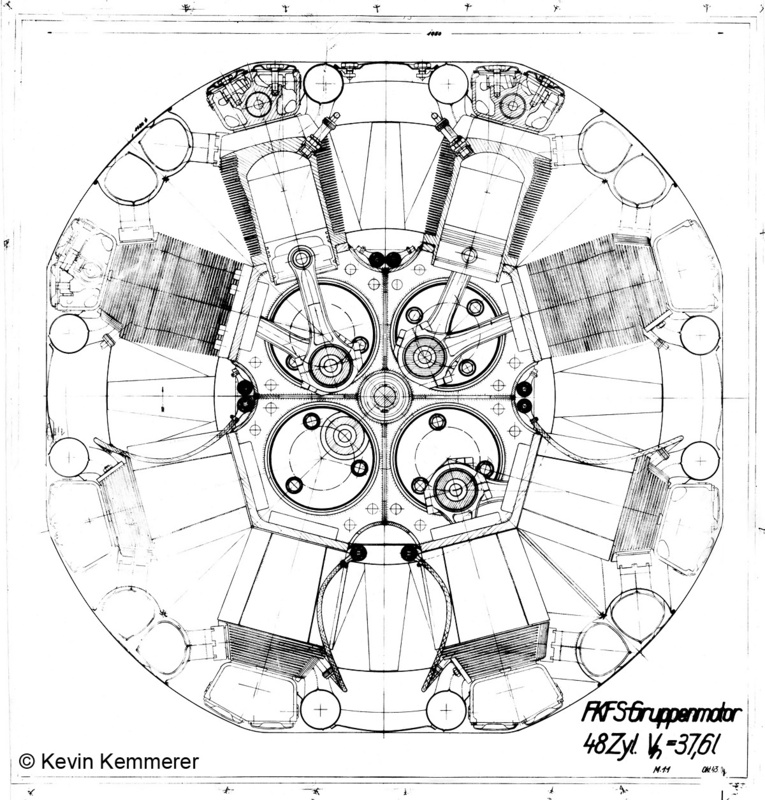 As the Gruppen-Flugmotor A was proving the concept of a grouped-engine power unit, Kamm, Krautter, and the FKFS had already designed a larger, more powerful engine in 1941. Called the Gruppen-Flugmotor C (or Motor C), the 48-cylinder engine had the same basic layout as the earlier engine but used new components. An engine-driven cooling fan was employed to help minimize cooling drag, as both Kamm and Krautter felt the Gruppen-Flugmotor A’s cooling drag was excessive. The engine also had contra-rotating propeller shafts and two five-stage axial superchargers that provided 11.6 psi (0.8 bar) of boost. The individual cylinders of the Gruppen-Flugmotor C were of Krautter’s maturing design, each having a capacity of 67 cu in (1.1 L). The cylinder had a hemispherical combustion chamber with two spark plugs and a port for direct fuel injection. The cylinder barrel and head were cast from aluminum as one piece, and the cylinder bore was chrome plated. A flange at the base of the cylinder attached it to the crankcase. Atop the cylinder was a housing for the intake and exhaust valves. The two valves were actuated via roller rockers by a single overhead camshaft, which served all the cylinders of one bank. Each camshaft was driven by a vertical shaft at the front of the engine. The Gruppen-Flugmotor C had a 4.33 in (110 mm) bore, a 4.53 in (115 mm) stroke, and a total displacement of 3,201 cu in (52.5 L). The engine was 7.17 ft (2.185 m) long and 4.43 ft (1.35 m) in diameter. The Gruppen-Flugmotor C was forecasted to produce 3,500 hp (2,610 kW) at 4,000 rpm with the original 67 cu in (1.1 L) cylinders, but studies of larger 92 cu in (1.5 L) and 122 cu in (2.0 L) cylinders indicated outputs of 4,290 hp (3,200 kW) and 5,920 hp (4,415 kW), respectively. While some components of the Gruppen-Flugmotor C were built for testing, a complete engine was never built. Seeing the potential of the Gruppen-Flugmotor C with 122 cu in (2.0 L) cylinders inspired Kamm and Krautter to create the Gruppen-Flugmotor D. Designed in 1943, the engine was very similar to the Gruppen-Flugmotor C, with 48 cylinders, a cooling fan, and contra-rotating propellers, but it used fork-and-blade connecting rods. The 122 cu in (2.0 L) cylinder was basically an enlargement of the 67 cu in (1.1 L) cylinder design. The Gruppen-Flugmotor D had four (one on each side of the engine) five-stage axial superchargers that provided 13.8 psi (0.95 bar) of boost. The Gruppen-Flugmotor D had a 5.31 in (135 mm) bore and a 5.51 in (140 mm) stroke. The engine’s total displacement was 5,870 cu in (96.2 L), and it was forecasted to produce 5,920 hp (4,415 kW) at 4,000 rpm. Reportedly, a complete engine was ready for tests in April 1944, but the state of the war and the progress of jet engines rendered the Gruppen-Flugmotor D and its further development irrelevant. At the time, Germany was in need of interceptor fighters, not long-range bombers. At war’s end, Kamm and Krautter were brought to the United States under Operation Paperclip, a program to extradite the best German scientists, engineers, and technicians and apply their skills and knowledge to further industries in the United States. The two men worked at Wright Field in Dayton, Ohio until they were released from their service. In the 1950s, Krautter founded his own engineering firm, the Wilkra Company, where he designed everything from engines for boats and motorcycles to lawn tractors and ski bikes. For a time, Kamm worked with Krautter at Wilkra but returned to Germany in 1955. Kamm revisited the Gruppen-Flugmotor concept when he designed a 60-cylinder compound diesel-turbine engine. 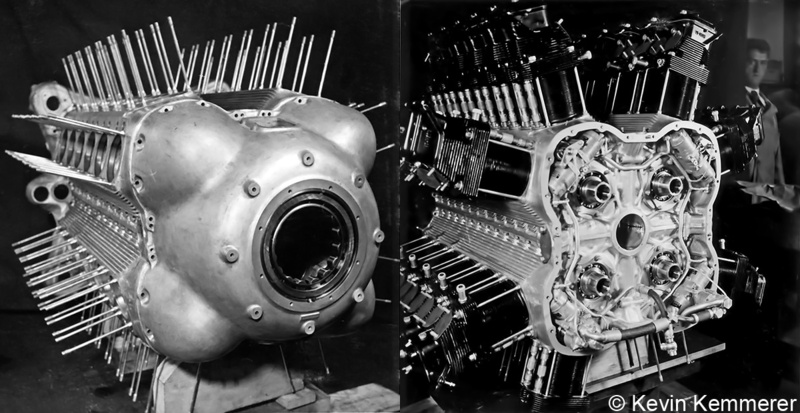 This engine consisted of five V-12 engine sections mounted around a central turbine. The V-12 engine sections were based on an extremely-high-output diesel engine Kamm had helped design while at the Stevens Institute of Technology in Hoboken, New Jersey in the early 1950s. 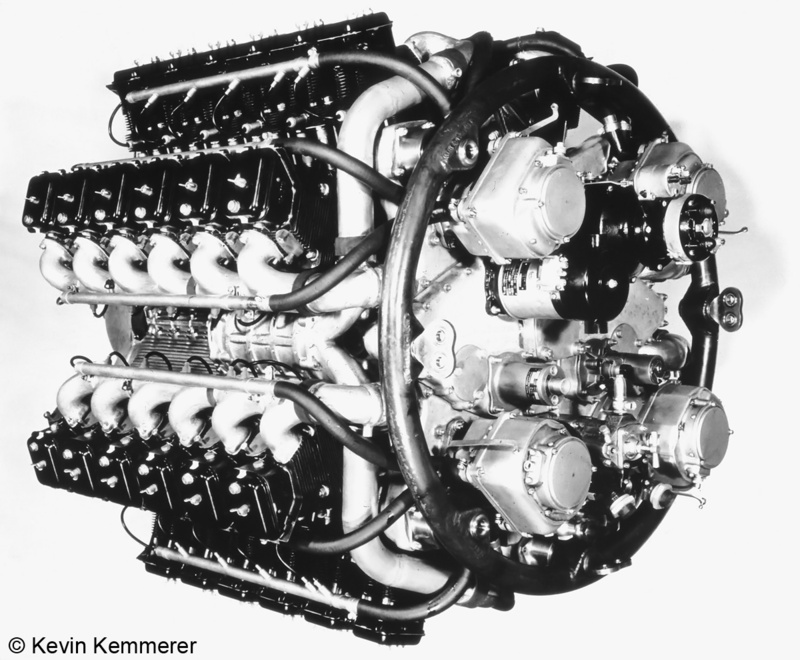 The V-12s were air-cooled, two-stroke, loop-scavenged engines with side-by-side connecting rods. 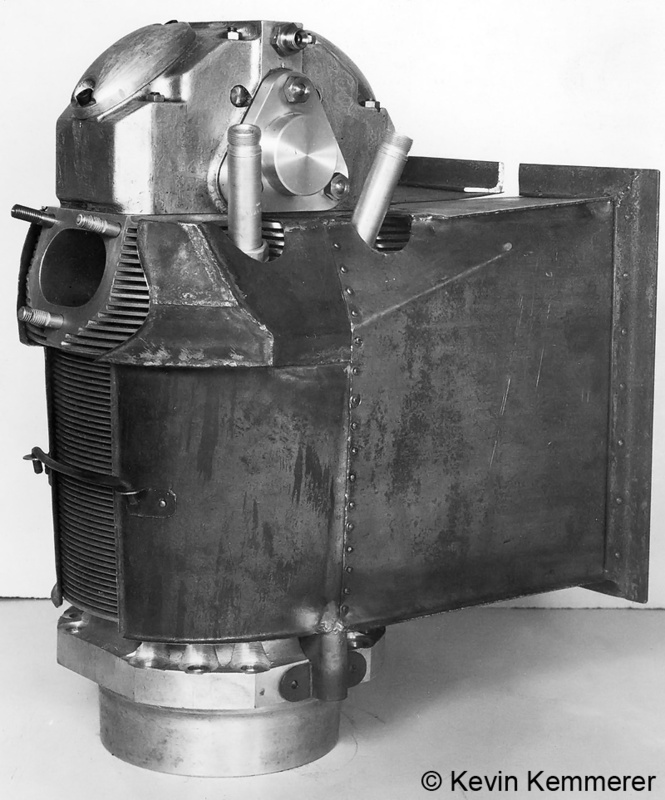 The turbine had a nine-stage axial compressor section, a combustion section, and a five-stage exhaust turbine section. High-pressure air from the compressor section would provide the incoming charge for the diesel engine. The diesel’s exhaust would be expelled into the exhaust section of the turbine. The turbine’s combustion section could run independently of the piston engine sections to increase the compound engine’s overall output. The engine’s bore and stroke were around 2.75 in (70 mm) and 4.5 in (114 mm), respectively, giving a total displacement of approximately 1,604 cu in (26.3 L). The 60-cylinder compound engine was designed to produce 2,950 hp (2,200 kW) without additional power from the turbine’s combustion section and 4,025 hp (3,000 kW) with the additional power. The engine would have had a low specific fuel consumption of .296 lb/hp/h (180 g/kW/h) and was forecasted to be 6.56 ft (2.00 m) long and 4.10 ft (1.25 m) in diameter. The 60-cylinder engine was never built. 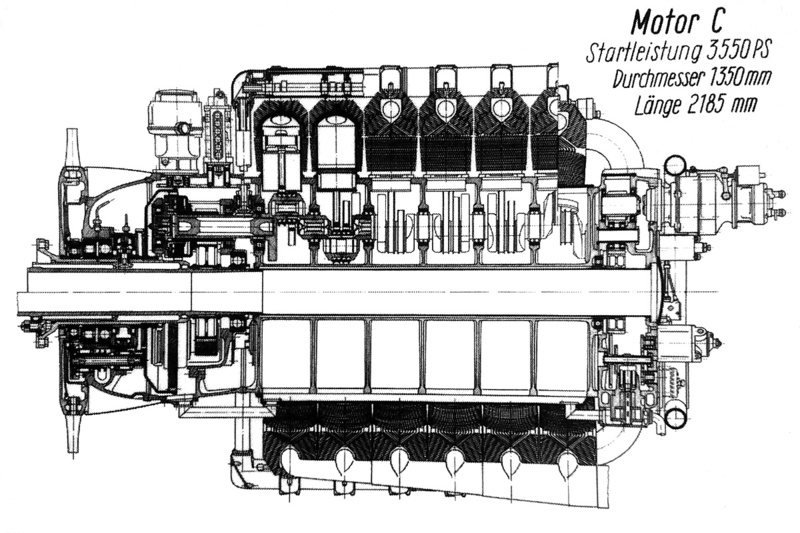 Note: Kamm and Krautter’s Gruppen-Flugmotoren were not the first time that multiple engine sections were combined to create a large, powerful engine. In the 1920s, the French firm Bréguet created the Bréguet-Bugatti 32-cylinder Quadimoteurs in a similar but less complex fashion. This entry was posted in Aircraft Engines, World War II on 24 March 2016 by William Pearce. Very pitiful the constant failure of Germany to manufacture a workable, dependable 2500 hp engine in ww2, they had nothing like the R-2800, good posting as Usual William.